Our commitment to the highest quality and innovation in the care of body and hair, has led us to be synonymous with beauty and high technology. Our engineers and stylists work to devise the ideal tool that easily gets the trend hairstyle or the most appropriate treatment, so that each launch becomes a small revolution in beauty salons and homes. And it is that at BaByliss, we initially work in the demanding professional channel of hairdressers, to then implement their improvements in products intended for the general public. In this way, BaByliss is an international brand, with presence in 60 countries thanks to the philosophy of promoting the natural beauty of each one making it more visible, a safe, easy and fast process. Pro Silence - 2200W 6611E. Maximum power and without noise. 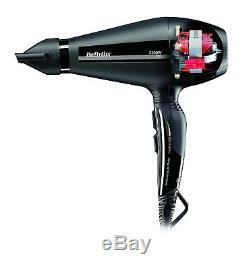 Silent but extremely powerful, this is BaByliss' Pro Silence 2,200W 6611E: it has all the essential features expected of a professional hair dryer being the quietest in its class. Its professional high performance AC motor, with a life up to 5 times longer than a conventional dryer, its high power up to 2200W, its air flow at 110Km / h, and its 6 temperatures / speeds, convince the most demanding, and they make the drying ultra-fast regardless of the density of the hair. Its ionic function will release static electricity for a smoother and brighter result. It also comes with a super thin concentrator so you can mark or dry certain areas more quickly. And since it will last a lot even if you use it daily, its filter is removable: so you can clean it easily and always have it in optimal conditions. Stay with its high technology at the service of beauty and efficiency, and with its exclusive Italian design. Professional Ac motor: longest life X5 (1000h). Silent: 81.8 dB - 50% quieter. Air speed 110km / h: fast drying. 2200 W: quick drying and easy molding. Ionic technology: neutralizes static electricity and frizz for fine, shiny hair. 6 speeds / temperatures: adjustable according to hair type. Cold air position: fixing the hairstyle. Fine concentrator (6 mm): Greater precision. Professional AC motor with 2,200W power. Air flow at 110Km / h. For all types of hair. So you can fix the hairstyle once finished. 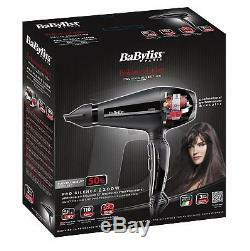 Eliminates static electricity and makes your hair look softer and brighter. Includes 6x75mm hub for greater precision. This product will not work in USA, Canada, Japan and other countries with 100-120V, unless you are using a step-up converter. It reserves the right to send items from national or European distributor based on the stock, at no additional cost. 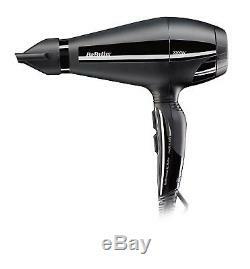 The item "BaByliss Pro Silence Professional Hair Dryer Ionic Ultra-fast Drying Genuine NEW" is in sale since Saturday, February 24, 2018.